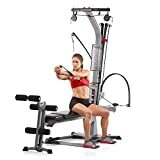 The Bowflex Blaze Home Gym is a useful piece of exercise equipment.It’s one of our top picks of the best home gym for this year.Similar to many pieces of Bowflex equipment, the Blaze incorporates Power Rod Technology. This piece of equipment provides quick fitness results that can help anyone start to feel and look better. In most cases, the user simply needs to perform exercises on this home gym for 20 minutes a day, three days a week. The Blaze includes more than 60 gym-quality workouts that exercise every muscle group in the body. There is 210 pounds of resistance available from the Power Rod technology that can be upgraded to 410 pounds. This piece of home gym equipment provides more than enough room for growth in strength training exercises. There is a lower pulley and squat station that is perfect for exercising the quads, glutes, and hamstrings. There is also the Lat Tower that incorporates an angled bar to help work shoulder and back muscles. There are even leg extension and leg curl attachments to build stronger muscles in the legs. The Bowflex Blaze was introduced in 2013 and is available for $799.99 on Amazon. The Bowflex Blaze is a versatile device that offers a great range of features. This home gym is foldable, which offers a practical storage capability. The workout area is 90 inches (W) x 38 inches (D) x 83 inches (H). It is important to add that many users suggest that the Blaze is not only enjoyable to use, but offers excellent results. The triple-functional ankle cuffs and hand-grips offer increased functionality. Additionally, the Blaze is highly regarded for its lack of noise, effortless assembly, and easy performance. The key to a stronger body is to perform strength training exercises to improve muscle strength. Although many kinds of aerobic equipment can use “resistance” to improve workout intensity; the results are not equal to that of strength training. The Bowflex Blaze offers strength training exercises that help users sculpt and shape muscle to achieve a desired result. The Bowflex Blaze incorporates the patented Power Rod Technology that helps offer a safer and more intense workout. 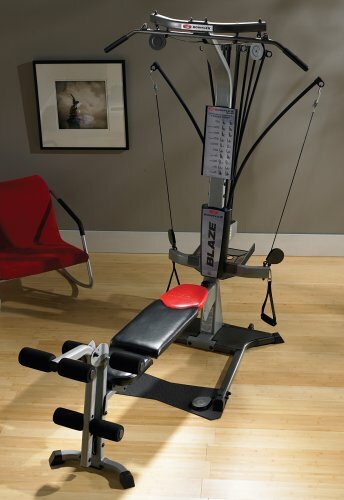 The Blaze literally offers several fitness machines in one piece of equipment. The lat tower with the angled bar helps strengthen shoulder and back muscles; while the squat station and lower pulley system work the quads, glutes, and hamstrings. Additionally, the device incorporates a leg curl attachment and extension that helps develop the leg muscles. It is important to add that any user that purchases the Blaze is also buying an aerobic device. This piece of equipment incorporates a sliding seat that enables the user to perform leg presses and aerobic rowing exercises. This type of exercise can help improve cardiovascular health and lung capacity. There are also triple-function ankle cuffs and handgrips that many users find extremely valuable. Instead of using different handles for different exercises, the Blaze was designed to use these multi-functional grips and cuffs for various. The multiple pulley positions and cable system also provides the user with the ability to perform custom workouts. The Blaze includes a workout placard that gives each user detailed steps to the popular Bowflex 20-minute workout. In some instances, the resistance offered by the Power Rod Technology can feel better than free weights. Many users prefer the Blaze over free weights as a result of free weights using inertia and increasing the risk of joint pain. The Power Rod Technology offers the highest-quality results and guarantees durability. The Power Rods are so durable that Bowflex offers a no-time-limit warranty. This means if the Power Rods are ever worn out, that Bowflex will replace them free of charge. As with many devices, there are a few potential drawbacks. Unlike the Bowflex Revolution and PR3000, the Blaze offers less intense leg and cardio exercises. In some instances, the resistance is said to feel lighter than using free weights for some users. Another issue occurs when the lat bar is folded. The bar does not rest securely on the mountings and it falls out of place when moving the machine. There are also issues with users that are taller than 6’4. The limits on the bench and cables will not allow users to perform certain exercises properly. However, more expensive machines such as The Revolution and PR1000 incorporate a longer bench and cables. On the Blaze, most exercises that require lying down and overhead exercises are difficult to perform for taller users. Additionally, some users complain about the leg attachment being uncomfortable and the ability to use cables and bows instead of weights. For the most part, the Blaze is a quality device that experiences most of its complaints and criticisms as a result of personal user issues. Overall, the Bowflex Blaze is an ideal machine for beginners and users that are new to strength training. The results from this piece of equipment can depend greatly on the individual. However, the users that witness the best results use the device’s versatility and distinct features to their advantage. The Blaze offers a smooth and discreet performance. The device offers a quality resistance level that can be easily upgraded; however, premium models such as the Revolution and PR3000 offer better resistance. These models are considerably more expensive. The Blaze, while cheaper, offers an excellent gym-quality workout for a device in its price range. The Bowflex Blaze is the best home gym for users that are just beginning training or starting training after a long hiatus. Users that do not plan to max out on the 210-pound resistance in near future may also benefit from this device. Although this is not one of the cheapest pieces of exercise equipment on the market; the Blaze offers flexibility, enhanced storage capability, and durability. The Bowflex Blaze Home Gym may take some time to get used to; however, this machine offers a wide range of exercises that are fully customizable. Most importantly, the Blaze provides an intense workout with excellent user results.